LibreOffice 4.3 has been released this week and it has already been noticed quite a lot, judging by the number of articles in the press worldwide. The announcement may be found here, and a thorough, technical description has been written by Michael Meeks on his blog (detailed release notes are here). I would like to discuss a bit what I think stands out in this new release; as such this is a personal collection of items and topics and not an authoritative list you could find in the release notes. Had this been a multi-platform announcement, it would probably have been the most touted feature of the release. The reality is that this only affects OS X users and the technical details are a bit more specific: toolbars background are now rendered natively on Mac OS X, essentially leading to a native-look and feel for LibreOffice on Apple computers. This is significant to me and to OS X users and gives a much welcome UI refresh to LibreOffice. I know we receive many demands – or rather complaints to “change our user interface” but most of these requests come from people who probably have no clue what such a change entails in terms of efforts and resources. LibreOffice’s user interface, as such is not outdated because it is based on menus and not ribbons. These two interfaces metaphores are two concepts that date back to roughly the same time (the eighties) and none of them is supposedly better than the other. LibreOffice however needs a background refresh at least and to look native or more native on each platform. Such changes happen in an incremental way, and the 4.3 illustrates this. 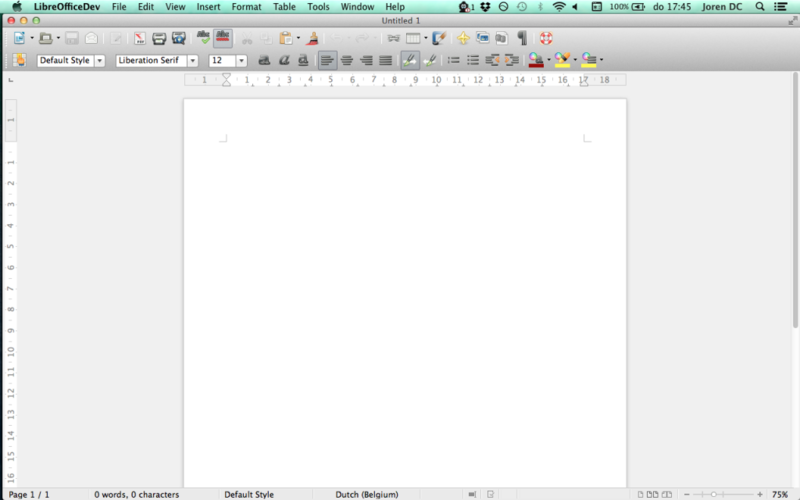 If you have a Mac, just download and install Libreoffice 4.3 and see by yourself what I mean. To me it is something major because it is by definition highly visible to anyone. I don’t think I would have hailed it on my top list just a few years ago but working more and more in a “collaborative fashion within a reasonably close physical distance” (read: in an office) I keep on noticing people printing documents all day long, then taking a pen, writing stuff, highlighting lines with markers… Of course you can add comments to documents with LibreOffice and go print-free. But people do print documents. All the time, all day long. I am planning a post dedicated to the never-ending legacy print as some aspects of this issue fascinates me. Anyway, it is now possible to print the comments you added in the margins with Libreoffice, independently of the file format (ODF or OOXML). This is a much awaited feature (other improvements for comments are also shipped with the 4.3), and it will let people continue to print endless drafts of their documents for many, many years to come. Apparently, we answered a deep and essential human need here – it did require a lot of work from the developers as well. LibreOffice 4.3 ships with many improvements in document filters: better PDF support, improved OOXML compatibility, new import filters for – get this- Microsoft Works spreadsheets and databases, alongside a whole series of ClarisWorks and AppleWorks filters, igniting in your desillusioned soul the hope that what’s been on this old computer and floppy disks of yours in your inlaws’ basement shall be retrieved at last. For this you must be forever thankful to the Document Liberation project. But, as good as it gets, the juicy bits here won’t come from the nineties, but rather from 2008. Regular readers of this blog will remember these glorious days, just before the big financial crisis, where Microsoft had created the so-called OpenXML standard that was supposed to be totally not competing against the OpenDocument Format, managed to have pretty much the entire standards community swallow it in the most creative ways possible, then fell short of actually implementing it in its own products. A good summary of the whole -technical- story is available here. The irony of life has the uncanny ability to devise ways to enchant us. Well, sort of. The format called “OOXML – Strict”, by comparison to “OOXML-Transitional” was the readable open part of the ISO 29500 standard, known as OOXML. For years, it was obvious that Microsoft Office implemented OOXML-Transitional (the heap of the more or less documented parts of the format alongside undocumented blurbs) and nothing else, creating a situation where one standard, OOXML was existing, and another format, OOXML, was fully implemented and spread all around, yet was an undocumented, proprietary specification. That’s the .docx, pptx, and .xlsx you see everywhere, and the one LibreOffice was busy reverse-engineering for all these years. We thus had to come up with another name for the “Stable” branch, knowing we could not satisfy everyone. “Mature” seemed to be the best term as it was conveying exactly what we meant. Mature, however, at least in English, can have some other unfortunate meanings that are as or even more popular than “LibreOffice Mature” on the Internet. After some try-outs, we came up with “Still”, as in “Still or Sparkling water”. It echoes well with Fresh, and manages to convey the notion of something that is less active, even quiet and “in a more stable state” than something which is fresh and new, yet already a finished product. Of course this concept works well in English and it will have to be twisted, if not radically altered in other languages, starting with French. Last but not least, this release has been a success and I would like to thank the developers, the growing Quality Assurance team, the localizers, the infrastructure team and of course Italo Vignoli for this tremendous job. Being involved in the actual release (publishing pages, handling social media among other things), I know the kind of excitement releasing a software like LibreOffice induces, but also the skills and the talent it requires: the LibreOffice project is lucky to rely on these teams of various contributors who make it happen, day by day. That is also one of the things that truly stands out in LibreOffice. 31 Responses to "A personal take on LibreOffice 4.3"
This “still” thing works well in English, ONLY with native speakers. Take it from me… a more-than-fluent-but-not-native English speaker, for people that speak English well but are not native speakers, the word “still” will NOT make them think of … tap water, but of something that is not moving. Not a very good mental image, when you’re trying to promote a product. Still for me reflects “no change”… Not what is wanted as well…. I’m aware that the UI will take a lot longer to change, and I congratulate you on your release, but please don’t be so defiant on the matter of Libreoffice’s UI. No, it doesn’t need to be a ribbon interface or copy Microsoft, but the advantage MS Office has is accessibility. I need to search on google to find out how to do simple things in Libreoffice, whereas when I’m at work using MSOffice I can see everything laid out and easily accessible. This isn’t an issue of becoming more comfortable with Libreoffice, I’ve used it for a few years now. I donate to TDF regularly and use/recommend the project, so I’m not just some MS fanboy open source hater. Usage habits of the UI should be studied (record amount of clicks?) to determine what options are used more frequently on aggregate and then those should replace the current menu structure. or it should be easier to customize the menu/even just having different template options so people don’t have to spend time customizing, would add identity and speed when updating to a new version or installing on a new computer. Hm… LibreOffice Sparkling and LibreOffice Stable? LibreOffice Vivid and LibreOffice Steady? Another possibility for naming: LibreOffice Active -vs- LibreOffice Stable. Active means the one we are actively promoting for use. Stable means the rock-solid version. Compare Pages UI and LibreOffice UI side by side and then you will perhaps realise that LibreOffice is nowhere near looking or behaving like a native OSX application. So, I decided to test it a second ago, on Windows 7 and Office 2013. I just opened such a file (just one mind you), and it opened without any problem or error message. Do you have any proof for your claim? Absolutely. Perhaps we should check this with the files that were tested and that gave such a result (file corruption). Let me stress again that we are talking about OOXML Strict. Not the regular OOXML file produced with MSOffice 2013. Re-read my post and you will perhaps realise that I nowhere made such a claim. (2) You need to document, in detail, where these files came from and how they were produced. First of all, the opinions expressed in this text are mine (Italo Vignoli), and cannot in any way be related to The Document Foundation or any other association I might be involved in today or in the future. I suppose that Charles statement about OOXML Strict not being opened by MS Office 2013 is probably derived from this post: http://www.italovignoli.org/2014/02/redmond-we-have-a-problem/, where I describe why OOXML has serious problems if you include the (in)famous February 29, 1900 date and then save as OOXML Strict. The document is trivially easy to reproduce. Actually, I have added a second column to show that once opened an OOXML Strict document Excel was able to handle the date filling function without problems, and I have discovered another bug as the dates restart from February 1, 1900 after March 4, 1969 (this happens multiple times). In order to show how the function should work, I have added a second document created with LibreOffice 4.3, where I have added a column that shows which dates should appear in the two columns generated with Excel. The OOXML Strict file cannot be opened by any other version of MS Office than 2013 (including MS Office 2011 for Microsoft), as the file is said to be corrupted. IMHO, this is a very serious problem, because a user cannot distinguish between an OOXML Transitional and an OOXML Strict file as they have the same XLSX extension, and if he tries to open the latter with MS Office 2007 / 2010, or with MS Office 2011 for MacOS X – all supporting the XLSX extension – he will get a “this file is corrupted” message. I have probably explained the situation in a way that has not made clear which was the version of MS Office which was not able to open the file. OTOH, I am not a native English speaker. By the way, my grandmother was born on January 10, 1900, and passed away on June 10, 1983. If I create an Excel spreadsheet showing all the days of her life and save it in OOXML Transitional, the dates are the right ones (but she has lived one day that never existed), while if I save the file in OOXML Strict my grandmother was born one day before (at the end, according to Excel, she has lived one day more than in the reality). The four documents are available here: https://dl.dropboxusercontent.com/u/116590/test.zip. Looking forward to your answer, especially on the development strategy behind Excel handling of dates on OOXML Strict. Unfortunately, the interface is neither native nor behaving native, it’s just mimicking the OS X native interface, and that is broken as well (try changing focus to a different application, then return to LibreOffice). In other words, this is packing unfinished-broken features, and then marketing them as big improvements. Thank you for the detailed information. It has enabled me to discover the source of your error in saying that Office 2013 cannot open up strict OOXML documents. And, let me be clear about this, the error is yours, not Microsoft’s. In your examples, you first create a new spreadsheet in Office 2013 that contains the infamous Feb 1 1900 bug that we all know about. You undoubtedly created this in the standard way, e.g., File.. New, or by clicking on the New spreadsheet icon. What you don’t seem to be aware of is that this by default creates an in-memory representation of a file that is intended to be stored in transitional OOXML format. You then store the spreadsheet in strict format. That file is, of course, guaranteed to be corrupt, because it contains date data that are related to the date bug. You then open it up in Office 2013, which then correctly identifies it as a corrupt file. So, Office 2013 does exactly what it is supposed to do. (1) In Office, create a new blank spreadsheet. This will be internally, of course in transitional format. (The reason for this choice is obvious, since the use of strict format is still relatively rare). (2) Save the blank spreadsheet in strict format. (3) When you want to create a new spreadsheet in strict format (e.g., without the date bug), open the blank spreadsheet and start entering your data. I have verified that if you do this, the corruption you noted in the corrupt file goes away completely. It will take you only a few seconds to verify this. If you want to create strict OOXML spreadsheets on a regular basis, you can save some time by saving your blank strict spreadsheet as a template. I have not verified this, but it should work. The in-memory representation should not have anything to do with the output… You might say, that ODF is the file format LibreOffice works with internally… If I save it as OOXML, it has to be transformed, but IF something goes wrong it is an export problem, or “wrong by design”… So why is it “as designed” by MS Office? Perhaps in an ideal world, but what we are dealing with is a workaround for a serious bug. The in-memory representation needs to “know” how to deal with corrupt date data, i.e., to ignore it or to flag it. That means there must be a slight difference, in the real world, between the two in-memory representations. There also needs to be other differences, by the way, since the strict format has some functions that work differently (more correctly) than their transitional counterparts. Please rethink “still”. I don’t think you want to be knowing as not moving. Your group is too dynamic for that kind of label. The model, which you have in memory has nothing to do with the file format, it is designed to fit the “native” file format best… So, why do not treat “if(document == TransOOXML)” things in the export and have a clean model, which do not need to know which file format it will be saved in…. Incorrect. Maybe if you were to build a new office suite from scratch, and ignore realities like the date bug, that is how you would do it. But when in Office (which has chosen to confront the reality of the date bug and introduce new functions in the strict version), every blank spreadsheet you create is internally in one of two formats. (They are almost identical, but not quite). Let me ask you a question: How would you solve the date format bug and the new functions, without having to resort to slightly different internal representations? @easson: Are you working in the software development world, because you seem to perfectly know the downsides of Word and still you keep saying “as expected”. That doesn’t help the spreadsheet software in knowing how to deal with files in different formats. Spreadsheet software has work to do, such as evaluating functions. If it doesn’t know the intended file format (e.g., transitional or strict), it simply cannot do its job correctly. That is why there is a need for somewhat different internal representations. As for my background, I wrote my first computer program, in FORTRAN II, in 1964. My MSc thesis and PhD thesis in physics both involved heavy computation aspects. Also, I have been the CEO of a software company. About the file itself, it is a corrupt file (obviously, since it contains invalid dates) that is correctly flagged as a corrupt file. You don’t seem to understand that rtf is only a word processing format, not a spreadsheet format. Big mistake!!! So, rtf has no functions at all, by definition..
And, odf covers word documents, spreadsheets, and presentations. I suggest that you admit to yourself that you simply don’t understand what you have been talking about. If you are willing to admit this, and then educate yourself about these technical matters, you might be a better person. I mean this in the best possible sense. Mr Ian Easson, although you are a Microsoft employee, you are a genius. In fact you have confirmed in a few lines what I have been trying to explain in years, i.e. that OOXML should be prohibited as it is a broken format (independently from being a pseudo-standard). 1. I have done what every user would have done: create a document (a spreadsheet), fill in data, save the document. According to you, I should have saved the empty document to tell MS Office that I wanted an OOXML Strict file! Come on, are U kiddin’? Such a process is against common practices, based – by the way – on years of use of MS Office, and it does not look like a strike of genius. ISSUE N° 1: MS Office is unable to handle OOXML Strict in the proper way, i.e. as any other document format (if I decide to save in XLS or CSV after having filled in the data, nothing wrong happens). So, let me be very clear about this, the error – horror? – is Microsoft’s and not mine. I would like to congratulate with the software architect that has opted for this unnatural behaviour, and I congratulate with you for having the guts to say that the error was on my side. 2. Actually, MS Office 2013 opens the file without any problem, including all the horrors in the date handling that I have described. On the contrary, you say that MS Office correctly identifies the file as a corrupt one, which means that you did not test it. By the way, I added the second column after having saved the file as OOXML Strict (according to what you have said, MS Office should have known about the format and should have managed the dates in the right way). So, the leap year bug is not there, but sometimes in 1969 the count restarts at February 1, 1900. Of course, assuming that the error was on my side, do you have an explanation for it? ISSUE N° 2: MS Office is unable to handle the dates even if it knows about the OOXML Strict format, which means that OOXML is a document format completely unsuited for spreadsheets. I would like to congratulate with you for having completely overlooked this problem. Of course, you were very happy for having spotted MY error (which was not mine, but you are probably not able to understand the concept that the end user is right and Microsoft is wrong), that you have not even checked the file. 3. The file does not open in ANY other version of MS Office supporting OOXML. In this case, MS Office tells the user that the file is corrupted. Here the issue is more complicated, so I wonder if you will be able to understand it, but I will nevertheless try to explain it in simple words. MS Office users are used to open files by double clicking on them, and are also used to format incompatibilities between MS Office versions. On the other hand, they are not used to “this file is corrupted” messages, and they usually panic when they see such a message. Also, they will see the message when opening an otherwise familiar file. According to your description of the problem, in the future there will be millions of users panicking when opening documents based on the OOXML Strict document format (which should become more and more popular, because it is a pseudo-standard). Of course, it could even be possible that Microsoft will try to hide OOXML Strict as much as possible (today, it is definitely not the first choice) in order to use only OOXML Transitional, as this is a proprietary non standard format locking in users (as much as DOC, XLS and PPT have locked in users for years). I tend to think that this is the untold Microsoft strategy. ISSUE N° 3: MS Office does not encourage users to switch to OOXML Strict, by keeping it well hidden amongst document format options, and therefore OOXML should be banned as a standard document format by any organization. I understand that all this sounds like evil to your ears, but unfortunately it looks like there are a few organizations who agree with this statement. 4. You ask Charles a retraction? Are U kiddin’ again? Microsoft, your company, and you – in person – have used false information about free software for years, and Charles should retract a true statement because you do not like it? Come on, you are a genius, so you should understand that the solution is easy, even for a simple old man like me: throw away Excel with the (in)famous leap year bug (you wrote that piece of code, didn’t you?) and rewrite it from scratch. Oh, by the way, as you have no respect for other people comments (on the other hand, you are a loyal Microsoft employee, and Microsoft employee respect only Microsoft approved opinions), I think it is fair to say that the fact that you have been developing software since 1964 means that there is crap code around since then. Albert Einstein used to say that the difference between stupidity and genius is that genius has its limits… Mr Ian Easson, it looks like your genius has no limits. Do you get the message? As I am just starting in the software development world I have to learn. But change the typo ODF to ODT… I know I am not always right, and I might be wrong here… But WHY 2 different models for OOXML? I can understand that one was introduced for OOXML, but 2? First, let me respond to your statement that I am obviously a Microsoft employee. Why is it that some people, when confronted by statements about a company and its products that they do not agree with, automatically “know” the person who made the statements to be an employee of that company? Do you really actually think that? To set the record straight: I am not and have never been a Microsoft employee or contractor. I have never set foot on a Microsoft site. I have only spoken with some Microsoft employees once in my life, around 1996. Ironically, that was on the subject of document formats, when they briefed me and other key Nortel Networks personnel on their plans to move Office to a more modern document format based on HTML or XML. (These efforts over the years then became OOXML.). I am actually a 66-year old retired physicist. Now let’s go over what you wrote. You wrote: “1. I have done what every user would have done: create a document (a spreadsheet)”. What you really did was create a spreadsheet that was designed to be handled as a transitional OOXML document, since you used the standard blank spreadsheet template, which is for transitional format. In particular, you would be allowed to put in corrupt date data. That is the way spreadsheets have worked since Visicalc and Lotus 123. It was a deliberate business decision by all spreadsheet companies since Visicalc, since otherwise, there would be a real problem with some existing spreadsheets. You then “fill in data”. What you did was enter dates that do not exist (e.g., Feb 29 1900), because that is what is allowed in all these cases. Your spreadsheet, in memory, is now corrupt. You then saved your corrupt in-memory spreadsheet in OOXML Strict file format. The result is a corrupt spreadsheet file. (1) If you had not entered corrupt data, none of the problems you mention would have happened at all. (2) Your file would have been corrupt even if you had saved it in transitional format, but in that case, Excel would have accepted the corrupt data without comment or change. (3) My statement about Excel 2013 flagging the corrupted file as corrupt was based on what Charles originally said. What it actually does is to try to repair the errors you put in. Actually, it is doing a good job with the corrupt file you created. This is not “unnatural” behavior. Now, there are other ways that Excel might have handled transitional spreadsheets with corrupt dates in them that are then saved in strict formats. For example, it might test every cell in your spreadsheets for corrupt date data before you save it in strict format, but that would impose a performance penalty. You write: “ISSUE N° 2: MS Office is unable to handle the dates even if it knows about the OOXML Strict format”. This not correct. In my earlier comment, I gave you the procedure to create a strict analog of your example. It will take you only a few seconds to verify that if you follow this procedure, there is no corrupt data entered into your strict spreadsheet when you fill down. You can then save the spreadsheet as a strict format file and re-open it, with no problems or corruptions. Have you done this procedure to verify what I wrote? I do not have Office 2007 or 2010 handy, so I cannot confirm this. However, since your file is indeed corrupt (it contains corrupt dates, which you put in deliberately), to flag it as corrupt seems a reasonable approach to me. You write: “MS Office users … are not used to “this file is corrupted” messages, and they usually panic when they see such a message.”. Well, since your file is actually corrupted, it is probably a good thing they are warned. Yes, Microsoft does not strongly encourage its users to move from the transitional OOXML format to the strict one, but if you were a multibillion-dollar company whose software had produced billions of OOXML transitional documents, what would you have done differently? Thank you and everybody else for this discussion. hmm, before even designing what would later become OOXML (Transitional or Strict, it does not matter), adopt ODF? Your latest comment, I think, perfectly illustrates what the problem is, and why so many people opposed the standardization of OOXML. The debate, at least on this post, is now closed.